We first had momos on our honeymoon in Darjeeling. Those were the best momos to date. They were piping hot served alongside a spicy red chutney in a small shack overlooking the snow-clad mountains. They were perfect for the cold weather. Since then we’ve had momos at small kiosks outside department stores, in supposedly good Chinese restaurants and at 5-star places and none of them matched those momos we first had. I made chicken momos last year for a party we had at home and they were great. They came very close to the Darjeeling momos if I do say so myself. Everybody loved them. I used the same recipe to make these vegetable momos and these were really nice too, but they don’t evoke the same kind of emotion from my predominantly non-veg family. Meghalaya one of the north-eastern states of India is bounded by Assam in the north and Bangladesh in the south. We’ve been to Shillong the capital of Meghalaya. Shillong is among the few urban areas in Meghalaya. Nearly one-third of the state is covered by forests. The much-repeated Cherrapunjee of our geography lessons is in Meghalaya. Cherrapunjee receives the highest rainfall of all places on earth. So cool. Rice and pork are the most commonly eaten food in Meghalaya. Different varieties of mushrooms that flourish during the monsoon are also used in the cooking. Fermented soyabean paste, fermented fish and different types of herbs are used to add flavour to the dishes. Dishes are sometimes cooked in bamboo cylinders or bamboo leaves which infuse the food with the flavours of bamboo. 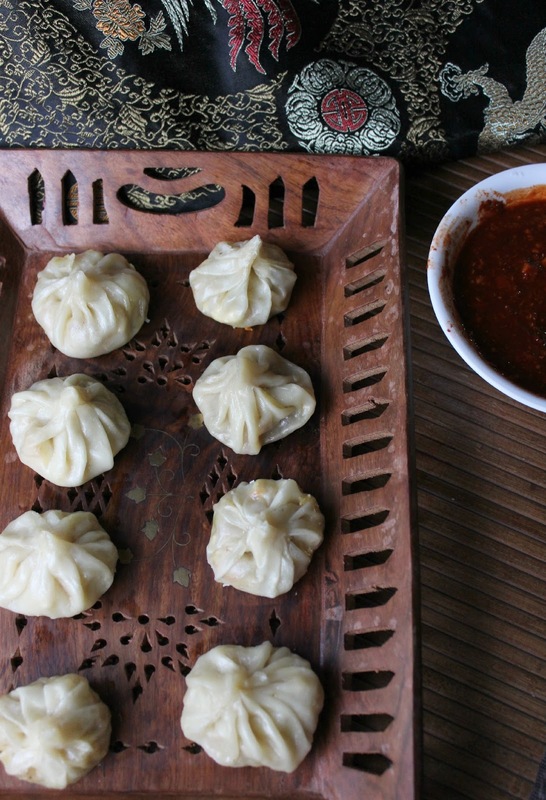 Momos are popular in all the north-eastern states. 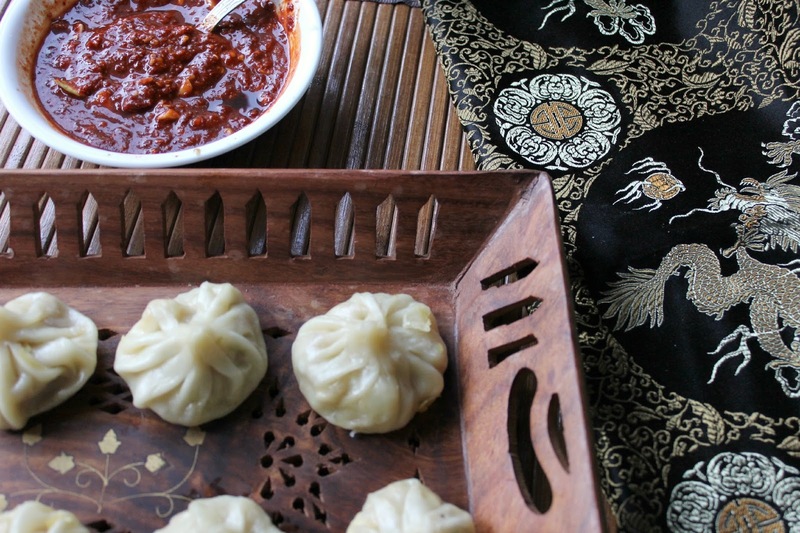 I made these vegetable momos and a hot red chilli chutney to go with it. I thoroughly enjoyed the combination. 1. Mix Maida and salt in a medium bowl, make a well in the centre, add water little at a time and mix well. When it all comes together, knead well into a soft, smooth dough. Then add the oil and knead again for a minute. Cover the bowl with a plate and let rest while for about 15 minutes or more. 2. To make a filling, heat oil in a kadai/skillet. When hot add the chopped onions and white part of the spring onions. Reserve the green part of the spring onions for the garnish. When the onions turn translucent, add the minced garlic and ginger and sauté for a minute. Then add carrots, shredded cabbage and crumbled paneer and mix well. Add soy sauce, chilli sauce, salt and black pepper powder and mix well. Cook covered for 5 minutes till the vegetables are tender but still have some bite. 3. Open, mix well, taste and adjust seasoning. Let cook for another 1-2 minutes uncovered. Switch off. Add the green part of the spring onions and mix well. 4. To make the momos, pinch a small ball of dough and roll out with a rolling pin into a small disc about the size of a poori. Make these discs as thin as possible. To make perfect uniformly sized rounds, use a metal lid with sharp edges to cut off discs from your rolled out dough. Keeping the disc on the rolling board, place a tablespoon of filling in the centre of the disc and bring together the edges of the disc towards the centre and pleat like you would a saree. Pinch closed the pleated ends together at the centre. Repeat with the remaining dough and filling. 5. Place in a single layer in a bamboo basket or idli steamer and steam for 8-10 minutes. Serve hot with tomato sauce or chilli-garlic sauce. 1. To quicken the rolling out process, roll out a big ball of dough into any hideous shape (it doesn’t matter) and then using the metal lid cut out several discs at one shot. 2. Roll out the dough real thin so that the momos are not too doughy. You’ll need to generously flour your work surface to roll out paper thin discs. 3. You could try other shapes like the crescent shaped or triangular samosa shaped momos as well. 4. The bamboo basket usually fits well inside a kadai or idli steamer. Pour about a cup of water into the kadai or steamer and place the bamboo basket on top. The basket should fit snugly into the kadai or steamer but not touch the water. The bamboo basket has a slotted base through which the steam enters. Alternately you can use an idli or idiappam steamer as well. 5. To avoid the momos sticking to the surface, line the surface with parchment paper, or lightly oiled banana leaf. 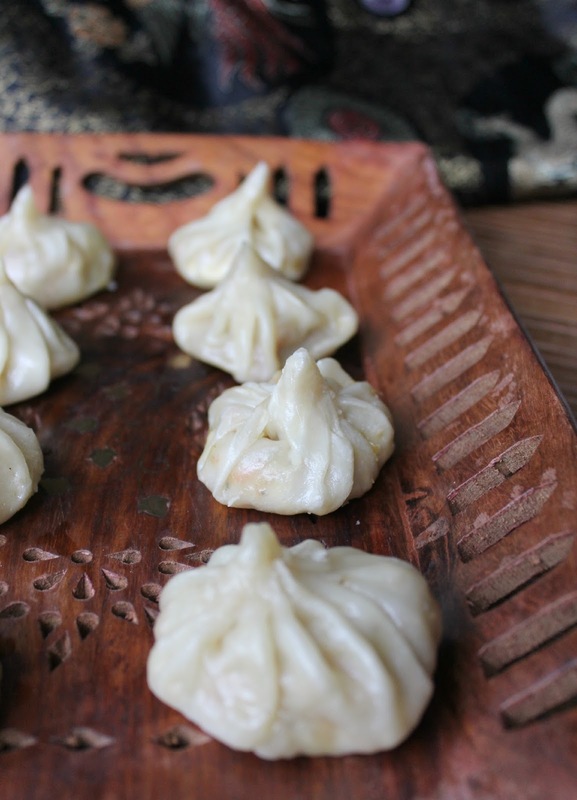 This entry was posted in Appetizers and tagged appetizer, Blogging Marathon, meghalaya food, momo, north-eastern cuisine, north-eastern food, recipe, snack, steamed momo, vegetable dumpling, vegetable momo. I can finish that beautiful momos anytime, you nailed them prefectly, they are just cute and hard to resist. The pictures have come out so well jayanthi..very lovely ones.. Perfectly made momos. Love that perfect shape and am sure these tasted very good. Nice composition and lovely clicks. I have loved momos ever since i saw and ate them…and you have made them so well, they tempt me. Spicy filling in the momos must have tasted great. Nice pictures. delicious and perfectly made momos!! Momos look great – you got the perfect shape of it. And the pictures also look good with perfect props especially the first one – the wooden tray and the balck designer piece of cloth behind it adds lot of beauty to these wonderful momos. Momos are perfectly made. Love your presentation. Perfectly made momos,the stuffing sounds inviting..very well presented. wow wow beautifully made momos , I wud love to finish them all 🙂 very nice presentation ! !